This performance embodies the Yemeni tradition that most often consists of a solo singer with oud accompaniment, highlighting rhythms in subtly expressive ways. 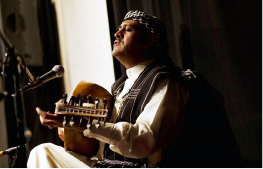 Renowned across Yemen as a musician and vocalist, Abdulrahman Al Akhfash has contributed significantly over the past 20 years to the natural development and enrichment of the Sanani repertoire. His delivery is expressive, occasionally euphoric, but ultimately poetic. Free, lighted parking is available in the municipal parking lot north of the AANM; enter lot from Michigan Avenue by turning north onto Neckel Street, just west of AANM.